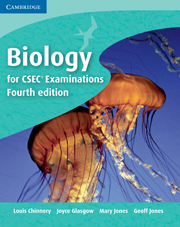 A revised and rearranged fourth edition of our previously titled CXC Biology. Comprehensively covering the CSEC syllabus requirements, this full-colour edition contains carefully controlled language to make the text accessible for a wide ability range. Biology for CSEC includes questions throughout to test understanding in progressive steps and reinforces new knowledge and concepts through revision questions at the end of each chapter. This edition also incorporates many investigations throughout the text, almost all of which could be used for the assessment of practical skills, and a full apparatus list which takes into account the new guidelines on safety. A detailed contents list, a complete glossary and a comprehensive index are also included.